For any homeowner looking for solutions to better organize their house, inexpensive life hacks can go a long way. There are a number of products on the market that can make a pantry or closet more organized, but many of these solutions come with a high price tag. These ideas will provide the inspiration you’ve been looking for to declutter your home. 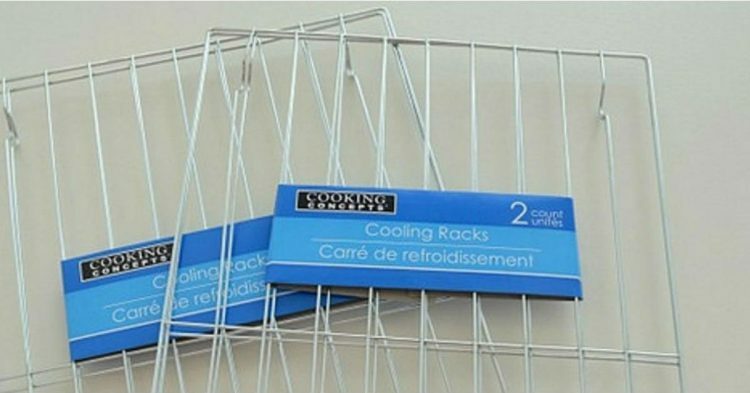 Best of all, you can pick up the materials at most dollar stores as these DIY hacks simply require a metal cooling rack. While cooling racks are used to cool baked goods after they come out of the oven, it turns out there are a number of other clever uses for the baking tool. 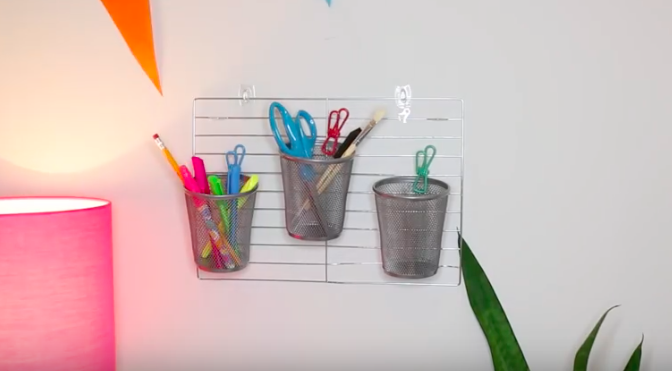 Hanging organizer: Using some inexpensive clips, attach pencil holders to the metal rack and hang on the wall with hooks. You can keep office supplies, such as paper clips, pens, scissors, and pencils, or you might put it to good use in the bathroom, storing makeup and brushes in each cup. Shoe drying rack: This is a simple hack to implement when the kids come in from outside with muddy, wet, or snowy shoes and boots. Place the wet shoes on a metal rack and they will have the air flow necessary to dry completely, rather than allowing the shoes or boots to sit in a puddle. Glasses organizer: If you’ve got many pairs of glasses or sunglasses, chances are they go missing or end up broken, but you can simply hang them on a cooling rack. There’s no chance of them getting crushed in a handbag or stuffed in a drawer and forgotten about with this organizer. 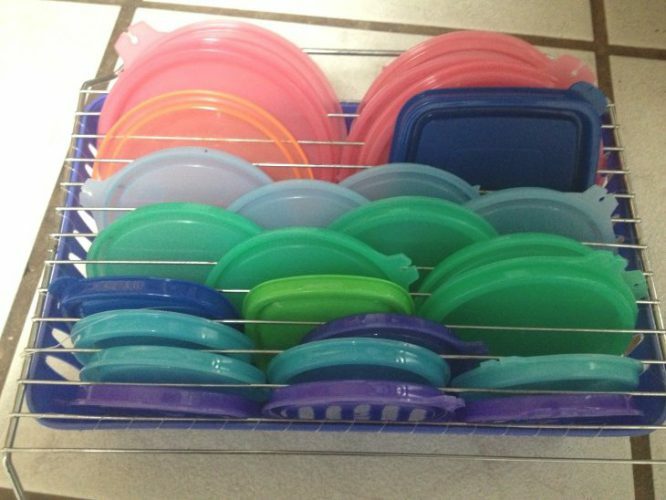 Plastic lid organizer: There’s almost nothing more maddening than a cabinet overflowing with storage container lids. This cooling rack hack is perfect for corralling those wayward lids in a way that’s easy to find exactly what you’re looking for. Place the rack over a bin and then place the lids in each slat. Scarf organizer: If you love to wear scarves, but don’t have an ideal way to store them, consider fastening a wire rack to a hanger, then place your scarves on the rungs of the rack. They’ll stay wrinkle-free and can easily be hung in a closet. Fabric organizer: Similarly, if you enjoy sewing projects, but it’s a challenge to keep all of your fabric pieces organized, you can thread the fabric through a wire rack that’s been attached to a hanger. Voila! Instant craft room organizer. 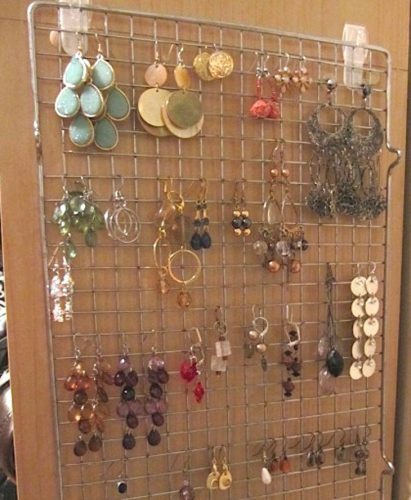 Earring organizer: If your dangling earrings end up in a tangle in a jewelry box or on the bedroom dresser, this will keep things tangle-free. Just hang the earrings on the cooling rack and they will hang freely and make finding the perfect accessory a snap. Memo display: If you’re a visual person or someone who writes a lot of notes, but those post-its and scraps of paper get lost in the papers on your desk, a wire rack is an excellent fix. Use magnetic clips to hold the papers and display your to-do lists.